Learning how to bake gluten-free is overwhelming when starting out. To a newbie, the selection of flour varieties and how to create a flour blend that mimics regular wheat flour can be so confusing! This was just my story when I started to bake gluten free over three years ago. I spent the first six months frustrated over the information that was out there so I took matters into my own hands. I locked myself into my kitchen until I understood exactly the world of gluten free flours and had created a trusted blend of my own that I could sub into every recipe I make. I have been using my own mix now for the past two years and have excellent results but my desire is to educate and encourage others to do their own experimenting to create a blend that fits their preferences. This guide is to help you understand what role each flour plays and how to create your own gluten free flour blend. Light: These are all of the starches—a must when creating a blend of gluten free flours. Medium: Though nutritious in their own right, these flours are a bit lighter when used in a recipe and are more stable to be used alone paired with a starch. Heavy—These are the more dense and nutritious flours that are rarely used alone and will need to be used in tandem with another medium-based flour. The more variety of flours in your blend, the different the results–how exciting! It’s like a controlled science experiment right there in your very own kitchen. You never know what tastes the best unless you start testing it out for yourself so use this as a base guide and branch out on your own to see what you like. Here is my gluten-free flour blend. As you can see, I prefer to use a ratio of 2:1 whole grain flour per starch. That means for every 1 cup of medium or heavy based flour, I use ½ c. of a starch. This particular blend is a great substitute in recipes that require regular flour, giving it a very nice texture, flavor, and color to all baked goods. Now if you are new to the world of baking gluten free, let me say that you will make mistakes. A LOT OF THEM. It is inevitable and you need to accept it now, and accept that this is a learning curve. Be open to it. The work is hard but the rewards are great. Now put your apron and sense of humor on, possibly grab a tissue (for many tears of joy and sorrow) and let’s get baking! Is this the end to the conversation? Absolutely not. The entire point of these Baking Series Guides is to help each other out. You might have a new nugget of knowledge I haven’t mentioned and I would love for you to share it with all of us. 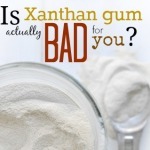 Is Xanthan Gum Actually Bad for You? This is an amazing guide! I love it and it’s very easy to understand. I use psyllium as a binder in my flour mix since so many people have a tough time digesting xanthum gum. This is a great guide, Cara! I love that you use sorghum in your AP blend—it’s one of my favorites. And I love the sound of your cake flour blend too—I have one I created years ago that I love, but I didn’t have instant access to it when I needed it today, so yours came up in a Google search (which is great, since I wasn’t aware of your blog before!). The thing I realized when I first made my cake flour mix was that it was the tapioca starch in my usual AP mix that weighed down my cakes and made them heavy and—for lack of a better word—bouncy. When I decreased the tapioca and subbed in other starches instead, it lightened the mix and my cakes came out perfectly. So that leads me to my real comment/hopefully helpful addition to the conversation, which is this: While I think it’s fair to classify all of the starches as light, I would argue that you can’t necessarily sub tapioca out for any of the other starches, because it adds what Bette Hagman describes at “chew.” (Just think of the tapioca pearls in bubble tea!) That makes it super useful in bread recipes but potentially tricky in baked goods that need to be lighter and more tender. Thank you so much for this guide—I know a good bit about GF flours and baking, but your example recipe ratios makes me want to do some new experimenting—it’s very inspiring and helpful! What s a good blend for making pasta? Personally I’d consider brown rice flour a medium flour because it’s pretty lightweight compared to buckwheat, teff, or nuts. I find it similar to sorghum. Also, I see white rice flour used as a starch in a lot of flour blend recipes; its refined and I’d consider it a light flour. Would you consider cassava flour to be a heavy based flour? I am new to your site and I am so looking forward to trying out the doughnut and bagel recipes in a few months. I am currently grain free but will introduce gf grains throughout this year. It will be so nice to have ‘normal’ treats with the rest of my family again! Hello, absolutely love your site, I have a question. Your got-to blend you have listed above, is that for everything, like breads, muffins etc..like an all purpose blend, correct? Coconut flour is so very absorbent, it’s really in a class of it’s own. The use a different flour in place of it, you generally should use 2 or 3 times the original amount. Ie, to replace 1/3 c coconut flour, use 2/3 to 1 c amaranth flour. Subbing coconut flour requires experimentation. Thank you for your detailed info. I only can use Teff, Corn flour, Chickpea flour, Soy flour, Rice flour in my diet. How can I mix it to make AP flour? Thank you so much! A whole grain flour blend I really like is 40% teff flour, 30% brown rice flour, 20% ground flaxseed, and 10% sweet white rice flour. A white flour blend could be equal parts brown rice flour, white rice flour, sweet rice flour, and cornstarch. Hi, I have have question in Medium base flour says seperatly Fava bean then garbanzo bean. I got a garbanzo bean with Fava bean flour (will the Bean flour be considered as one or 2) when creating fl blend. Combo 2 or 3?) thank you. Never mind I got it :). This is SO helpful. Just printed each one off to keep in my cupboard for reference. Thank you!!!! I’m new to your site, I’ve been searching for hours for a gluten free bread recipe with no eggs for my very highly allergic daughter and I can’t wait to try yours. She doesn’t have celiac but she’s highly allergic to wheat, nuts, eggs, dairy, the list goes on. In your post you mentioned hemp hearts as a milk substitute, but that won’t work for us either. She uses rice milk, it’s the only one she can tolerate. I’m curios to know if you’ve tried rice milk in your recipes. Amazing blog first off, so helpful. Would you say that all items in a category can be used in the same amounts? 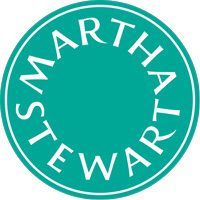 like say your recipe calls for 1tblspoon of corn startch and you want to replace with potatoe or arrowroot startch , are they interchangeable at 1 tblspoon? Very new to this! and I cannot seem to find the answer to the question so I apologize if its a silly question. Hi Anna 🙂 Rye actually has gluten in it so it doesn’t classify in this list BUT on the bright side, it is a great flour choice if you don’t have to be gluten free. I really don’t advocate anyone going gluten free just for a healthier option because it really isn’t always healthier (you do have to use a good amount of starch to offset the gf flour blends in some cases). I’d just stick to better choices in flours that have more nutritional value like rye, einkorn, 100% whole wheat, spelt, and the like, if you don’t have an autoimmune disease that prohibits you from consuming gluten. Hope that helps! Just came across your blog looking for yeast-free bread. I am not gluten intolerant, but find that cutting back helps. I had not thought about the candida connection, and will consider. I am actually far more intolerant of tapioca and potato starch, as well as fully allergic to chickpea/garbonzo flour than I am of gluten. I wanted to applaud you for reminding us that Gluten-free is not always a better choice nutritionally. I have been experimenting with dark spelt and hav had some some successes. I will use your yeast free-bread as a guide as well as explore more about candida. I go on terrible high carb jags, that I can’t seem to prevent myself from eating…..Thank you so much for a very well informed site. Rye is to be avoided if you want to gluten free! Hi Cecy 🙂 I think (now, I’m just taking an educated guess here because I haven’t worked with pea flour yet) it would fall into the same category as garbanzo bean flour. I’d say it’s like a medium flour because it’s isn’t too dense or heavy but most definitely would work best with another medium based flour to offset the flavor. Hi there! Thank you so much for this guide – it has helped me understand how to mix the flours AND get better results. I have to ask though, what of tigernut flour? I know tigernut is a tuber and doesn’t fall into any of the above categories, but its purportedly a fantastic substitute. In fact, from my research, some say you can substitute it alone for wheat flour in a recipe. I have not tried it though. What do you think? Hi Daydah! Tigernut is recently new since the creation of this post but if I were to guess, I’d say it’s a medium flour but I wouldn’t rely on using it as a 1:1 sub for regular flour, especially if you are not using eggs. I have used this flour for making cookies and it worked well because you don’t need a big rise on those but depending on your dietary needs, I’d consider using it as a mix with another flour. Thanks a lot! I have since experimented, and you are absolutely right. Combining with another flour is the key, if making anything that needs a rise. Eggs are not off my grid, so I may still try it alone but with eggs. Will be happy to share my results. Thanks again! I forgot I do have one Very important question about the mixes. Since starches have been added to the flour mix (i.e. millet, amaranth + arrowroot) do I still follow the recipes and add More starch or leave it out??? I’m not much of a baker so I’m learning as I go. Thanks. Do some of the flour combos work better for baking bread and others for things like cookies and treats? Or is it all the same? I would like to see that breakdown in the charts. Thanks!! I’ve been gf for two years to solve stubborn gut issues and have had the hardest time with flour subs. Partly because I’m also allergic to oats and my husband is allergic to potatoes, corn, and almonds! This article is a godsend. It will sub flours so much more confidently from now on! Thank you! I want to try making your bread, however, my grandson also cannot have any sugar. 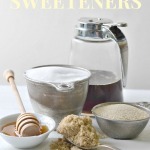 What would happen if I eliminated the sugar in your recipe? Any help would be appreciated. No wheat, oats, eggs, sugar, plus more. Sugar is the easiest thing to replace in baking I think. Just use honey, 1-1 switch. Depending on the recipe you may need to adjust the liquid a little as honey is considered a liquid. I just made brownies the other day and had to substitute honey for sugar and arrowroot powder for cornstarch (I forgot to switch out the butter for coconut oil though) and the recipe turned out fine. Mess with things a bit and you’ll be able to make lots of stuff you thought you would not be able to have any more. I’ve lost 17 lbs without trying and still get to eat treats! whoo hoo!. I’m glad I live 2 minutes (literally!) from Bob’s Red Mill! I also get good flours at New Seasons. I’m not too sure about ordering this sort of thing online. Watch for coupons if you live in Oregon. Bob’s has specials each month too. I am new to your website and so far it is amazing – thank you. Have only been diagnosed GF & Diary free a few months so all the help one can get is so appreciated. It is an exciting journey and info such as your floor mixes is a gift from heaven. Will have to investigate Amazon Aust re flours etc as pretty sure would not be able to receive from Amazon Us. I notice your blends call for 1 or 2 starches. I am allergic to nightshades…or in this case the potato starch. Could I use arrowroot and tapioca as the starch’s when I blend GF flour? Hi. Tapioca is derived from cassava which is a nightshade. Cara, would storeroom and corn starch work? It looks like it would. Thanks! So informative and very helpful! Can this flour blend be used to make pasta as well? Hi Cara–thanks for the great information. I have a friend in our Sunday School class who is gluten-intolerant . When we get together for socials, I’m always concerned that she will have enough she can eat. I have been buying more gluten-free flours to keep on hand, but I live in a rural area & though our local grocery is doing better at adding organic & gluten-free products, it is a far cry from having access to a Whole Foods or Trader Joes store. Do you have any suggestions for online sites that are reliable & don’t charge a high price for shipping? First of all, you are so kind for making sure your friend is not left out! Seriously, for someone who has food allergies and knows that people don’t typically go out of their way like that, it just makes me want you as a friend 🙂 I buy all my flour from Amazon and it’s especially great if you have Amazon Prime. You can even buy the Trader Joe’s All Purpose gf flour mix there (which is a really great flour blend to have on hand). Hope this helps! Pat, I am very fortunate to have a grain mill and I use it often. I buy sweet rice flour and grind it superfine. I go to Super H, an Asian grocery store and buy it in 25 pound bags. It costs about 1.25/pound! I too have bought whole grain buckwheat from Amazon and I grind it into flour. I just bought coconut flour at Trader Joe’s a few weeks ago and it was very reasonably priced. Your story is touching to me personally. Many years ago I made baked goods for those at my church who had allergies to dairy and wheat so they would have choices when we got together and shared food. Little did I know several years later my own journey would lead to a diagnosis of gluten and dairy allergies. I hope you will be able to find a source for your gluten free grains. 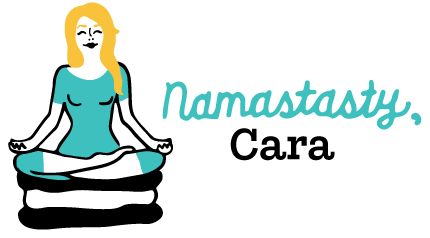 Cara, Your website and candor about what you have experienced and learned is invaluable to me. I deeply appreciate your willingness to graciously share your wisdom and insights. I am grateful for the time, effort, and dedication you put into creating, failing, and trying again and again. Because of your successes it is easier for me to live a healthy life gluten and dairy free. Hi Cara- thank you for the recipe. I had a question. I am not fussed about GF but more so go eggless, so instead of Cara flour, could I use normal flour? Please do let me know. Sorry i meant your GF and Vegan Brownie posted on your website…could I make this with normal flour? Wow! This is a very useful page and I really enjoyed reading article and all users’ comments. BG Bakes is an online store which provides Gluten Free and Allergen Free products. We use high quality ingredients. Our customer’s health is our first priority. Thank you for sharing valuable information. 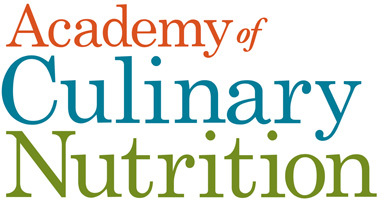 Gluten free posts of Cara’s inspire me to keep learning and keep cooking! I made a gluten free pie the other day that was great. I feel free to add things I would never have tried before due to the wonderful info and the great fun attitude Cara adds to her posts. I am thankful for the insights and help these posts have given me. Please keep them coming!! Great work. I’m experimenting with gluten free these days, so this is very helpful. I have a loaf if bread in the oven now with my own gluten free blend that I tried to put together using your guidelines but minimizing the amount of starch….but it’s also yeast free so I have no clue how it will turn out. But at least I’m trying right? Absolutely!! When we stop fearing and start experimenting, that is the beginning of becoming master of the kitchen 🙂 Well done! Very proud of you. How did the bread come out? This is the best. reference. ever. I’d like to try your recipe for the Gluten Free Bagels, but need to replace the oat flour. Since White Rice Flour is on the list of medium based flours, would that work for this recipe in place of the oat flour ? So nice having the reference guide to all the different gluten free flours. Thanks ! Hi Cara. I was wondering what you thought about vegetable flours, such as homemade carrot or sweet potato flour, to not only make baked goods Vegan but also alkaline. All the best, Catherine. Hi Catherine! I have not yet baked with vegetable flours however I do have samples waiting for me to experiment with. I cannot wait to do so and will let you know my thoughts! FINALLY! I found the website I’ve been looking for! I’m just starting out with baking gluten free and it is so incredibly overwhelming searching and searching for a recipe that does not have a milllion ingredients or eggs or xanthum gum. I was thinking of giving up the search – and then I found your site. Now I’m actually excited to begin and with your easy to follow breakdown of what all the different starches and flours are about, I know I will be able to create bread that is gluten free and nutritous. Yay! Thanks – Aria from New Zealand. Would Cara like to tell us how she defines potato flour, pea flour, and mesquite flour? Also, another website said that white rice flour is a light starch and not a medium. What does the author say about this disagreement? Hi Cara! I’m so exited that i’ve found this website. 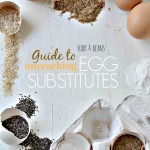 Your egg substitution guide and gluten free flour guide has been a big help. I wanted to use combo three but i wasn’t sure how many cups of flour that i should use for the flours like arrowroot, sorghum, and brown rice flour. I have a question…I can’t have potato starch, so if I were to use your blend above, what could I substitue for the 1 1/2 cups of potato starch? Thanks! Hi Linda, you can definitely use all arrowroot or use cornstarch or tapioca starch as a sub for potato starch. Hope that helps! So excited to find this. I’m thinking I might have a gluten allergy and have been trying to do 60-days without it and it’s been so difficult. Not to mention just trying to stay away from highly processed foods which regular flour is. Oh my gosh what a GREAT resource for gluten-free flours! I have barely ventured beyond almond and coconut flour, and I’ve always been disappointed in the results. Now I know why. Thanks so much for sharing all this info! We’ll be sharing it with our FB fans next week! I’m a wanna be student of Alton Brown. I like to have accurate measurements and love utilizing my digital scale whenever possible. That being said, do you know how many grams of each component to use? I know each flour/starch can vary in weight per cup. I enjoy a good experiment… Just can’t afford too many flops. Agreed! Yesterday I used the flour mix posted above, and the chiaseed/flaxseed for eggs and made the brownies inside the Bakers Unsweetened Chocolate box. I substituted coconut oil for butter and cut the sugar by a third… they were one bowl, done in 30 minutes fantastic. Cookie craving totally satisfied. I have enough to take a massive brownie to lunch everyday for a week… if they last that long. Try Pamelas baking goods. Excellent and healthy flour blend. I love it. I am poor… destitute in the eyes of an average person, I am sure of it. I find the fact that I have gluten allergy and am a vegan – very very unfriendly to those living poverty – me. This site makes my experimenting less risky and I can’t even begin to tell you how much that means on a tiny budget. Doing a PHD with no job at the end of it has been a challenge enough on its own… starving would be the brutal icing on the ‘follow my dreams’ cake with out a source like this, like yours. Thank you for helping me with informed shopping decisions. It means so much. I too sincerely appreciate the education regarding gluten-free flours. I am going to order the book too. John (Mar 1,2014) hoping you find work soon. Good luck. Again, thank you for the wonderful resource here! What great resources! Love your flour blend! The sourghum brings more protein which is very much need in a gluten free flour blend, especially for cakes and pastries. Cara mia, GRAZIE! THANK YOU VERY MUCH! MERCI! MUITO OBRIGADA! GRACIAS! TODA RABA! I just found your blog, and looks like you have a recipe book. How should I proceed to get your book? I am in trying my “flat breads” with tapioca flour, and white corn flour, my next step is rice flour but I had no idea which one, now I know! I sent your link to my best friend, and she loved also. You made GF palatable for us. Keep the good job. JANE!! I love you and your comment–thank you so much for this. What a way to end my day. Thank you! Merci! Gracias! Right back at you 😉 Click here http://www.forkandbeans.com/buy-cookbook/ for all the links if you want to preorder my baking cookbook. Hey there. Oh my goodness I have spent so much money on gluten free flours for waffles, pancakes and all baked goods. Thank you for helping us all. If we use your flour blends, can we follow a regular recope? Do we need to add guargum? I cannot even tell you what reading comments like these does for me! This is why I do what I do–I remember being there myself and remember how lost I felt. If I can take the guess work from one person, it’s worth it. Thank you for telling me this Janeen. Much love to you on your gf journey! If you ever need anything, please don’t hesitate to ask… xo! So if a recipe calls for a heavy flour like almond (and I already have a zillion different flours but not that one), can I just substitute it for any of the other heavy flours and get the same or similar results? Wonderful list and so beautifully presented. Tapioca flour also provides a chewier texture other starches such as corn and potato. Thank you so much this was so helpful! Not only am I new to gluten-free living, but I am new to baking as well. Im making a yellow cake for my boyfriends birthday this weekend and was wondering which mix you recommend? LOVE this set up and explanations! What is your advice for a sandwich bread? I am thinking adding the teff to your personal all purpose flour? If that sounds like a good idea, how much would you suggest? Once I get the bread thing figured out the house will truly be gluten free (and safer for me!) THANK YOU! I love how you made this so simple and informative, especially with the photos. Curious, though, why you don’t mention zanthan gum? That’s a great question, Jane! I am actually doing a whole topical series on gums and that is why I didn’t mention it. Thank you for bringing that up! Very helpful and informative, thanks! oh yeah! Thanks, after the recent mashed potato tasting cookies with chocolate chips I knew we needed help staying gluten and soy free! Whoot! I am so pleased to have found your site–you break things down so I can understand this craziness of being suddenly gluten free. I am glad you added the bit about tissues as this can be so frustrating and rewarding at the same time. Thank you so much–I can do this now. At 63 I never would have thought about any of this –I was the one always baking all the time. I agree with Helen –the books I had purchased made everything so daunting I had said no way. But now I am making baked goods -even pizza again! Another incredible post with invaluable information! Thankfully, I’m not gluten intolerant, but my sister-in-law is, and I’m going to send her (and my brother who does most of the cooking!) the link to this. And it’s great to have this resource for when you want to mix things up (no pun intended!) just for fun. Thanks so much for sharing! Thanks Cara! I use a mix of 60% starch and 40% grains – the grains I use are usually mostly a mix sorghum and millet but I sometimes add oat or buckwheat or brown rice in depending on what I’m baking. Your chart takes this even one step farther with weights of flours. I do prefer to measure by weight when baking though. It makes more sense to me. I became very discouraged with each and every gluten free cookbook I purchased as each author had their own variation of flours and/or flour products to sell.Your amazing chart explains so much more than I have learned when reading the cookbooks and self help books. Thank you for this chart!! I will send recipe for anise cookies soon! this is amazing! so helpful.